Home 2018 April 9 Is the Death Penalty Fair? I am passionate about this issue because it is a life or death situation and in most cases involving the death penalty, the convicted don’t deserve to die. In extreme instances, innocent lives are taken away. The authoritative figures in this country have the power to stop it and save lives. Before starting this project, I didn’t know much about the project, except for the fact that some of the prosecuted are innocent and that lethal injections and electrocutions are used to end their lives. I also knew that it isn’t as common as it once was and is only used if the criminal performs a mass felony, such as mass murder or treason. Now, after doing the project, I know that the death penalty involves much more than an innocent or guilty verdict. 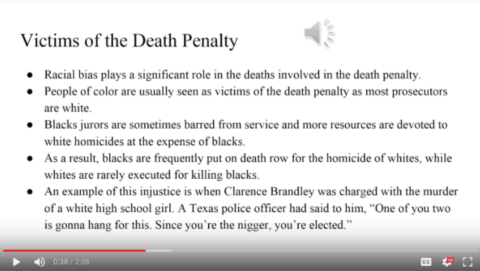 Race plays a large part into who is sentenced to the death penalty and most prosecutors are white, giving the Caucasian race an advantage. I also found out that different states accept different ways of performing the penalty and that it has more opposers than I thought. Is the Death Penalty Fair? by Rachel R. is licensed under a Creative Commons Attribution-ShareAlike 4.0 International License. A Man-Made Tragedy: The Impacts of Global WarmingWhat is Global Warming and How Can We Take Action to Prevent It? 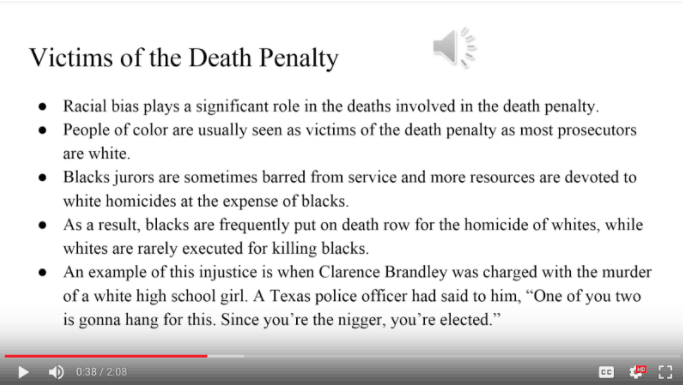 Racial bias does play a huge role when it comes to death penalty of a white or none white person. Because in many cases the judge is in favor of the victim whether that the judge is black or white, almost in every case almost 90% of the time, judges are always trying to protect or are in favor of the victim. No one should have their life taken away just because of a mistake they did.